If the Howrah bridges, Victoria Memorials of this 300 years old Charnock’s city reveal the rich historical past and grandeur then can the trams which are christened as the ‘lifelines of the city’ be left behind ? certainly not . 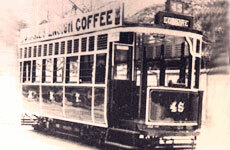 Ever since the first tram which rolled out in the tracks way back in Feb 24th 1873 this sturdy built electrically driven carriage has gone through the wears & tears with the ravages of time, carving out our golden phases of history. Braving out the illustrious moments of our Indian freedom struggle, World wars, Kolkata tram had come a long way and still its wheel continue to pave its way as a rail witness of the present era and hopefully for the future too. Having nurtured the rich heritage of this city of joy, kolkatan tramway has itself turned into an unique heritage of its own with a different essence.